Easter, I am fully aware of the importance of this holiday to some, heck my Dad's a preacher. But I am now of another faith. So, for me, it no longer has that meaning. Now for me its about springtime, colored eggs, chocolate, bunnies, and flowers. 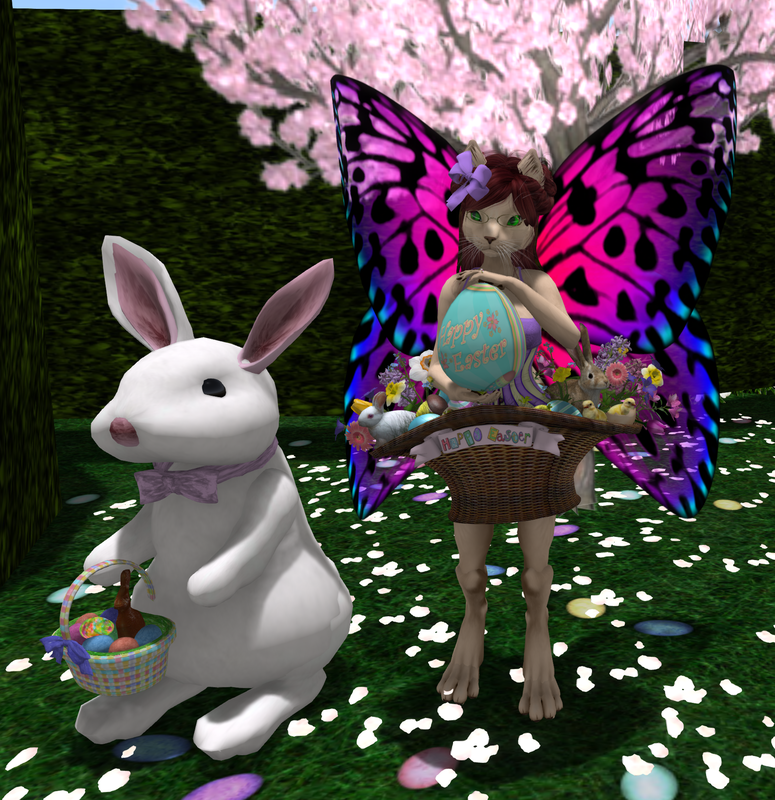 And so to revile in those, I chose two areas, 2015 Easter Town and Botanica's A-Mazing Easter Egg Hunt to explore. You can see all of the photos I took here . Easter town is on the sim that for every holiday they change the theme. I'm not sure what the next one will be, possibly not open till they do it up for the 4th of July. It was bright, colorful, and cute, with many things to do and buy. Events, Hunts, games, and poses all over, there is even an egg decorating contest going on. You could win 7000L ! But it was SUPER crowded with a lot of newbies and something was making my viewer eat up memory to the point of crashing. JUST on that sim, it was fine on others. Might be my system, a graphics card glitch, but thought to warn others if they go. I did enjoy it though! I picked up some things and may go back for a tree they have..
Botanica's A-Mazing Easter Egg Hunt is the other place I visited. I went to two places as, due to the above mentioned Memory crash and very crowded issue I was not able to stay on long enough to set up and rez in the props to get it done at easter town. Plus I just LOVE the Panoramic eggs they had set up in the Egg hunt area! A bit out dated as they used a lot of Alpha textures and low prim mesh, but still very pretty.